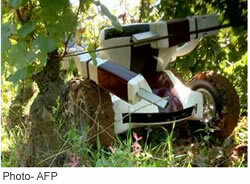 October 01: Robots have been working in manufacturing for decades, but a new robot has been designed specifically to help winemakers prune vines, by a Burgundy based inventor who claims it can prune up to 600 vines each day and despite its high cost of $32,000 it has features that justify the new machine, making several top class French producers offering their vineyards for demos. According to a report by AFP, the new robot named Wall-Ye, brainchild of Christophe Millot and manufactured by Guy Julien, the toolmaker who partnered him, was launched on September 12 and is one of the robots being developed around the world to help vineyards solve the labour shortage problem. Both California and New Zealand are also developing intelligent vision-based pruning robots. The robot does chores like pruning and de-suckering, removing unproductive young shoots as it collects valuable data on the health and vigour of the soil, fruit and vine stocks, using six built-in cameras. It also includes a GPS and gyroscope that serve as a security feature, so that if it were stolen the robot knows when it's not where it should be, according to the inventor. "If that happens, the hard-drive self-destructs and the robot sends a message to the winegrower: 'Help!'" Demos using a prototype have already sparked a buzz in winemaker circles. Excited vintners have called up Millot with a list of tasks they'd like to delegate to the robot. Big name French vintners like Chateau Mouton-Rothschild have already offered their vineyards as a venue for the 20-kg robot to show off what it can do. Millot's inspiration came from a frustrated winegrower at the Burgundy producer Domaine Louis Latour, while on a tour of his vineyards in France's southeastern Ardeche region. "He needed to thin the leaves, because the clusters were too big and they didn't dare use a machine but they couldn't find workers. It was August and everyone was on holiday. I told him I'd make him a robot," said Millot who took three years to develop Wall-Ye. The biggest challenge was to make the cameras understand what they saw and how to interpret it, says Millot. Labour issues aside, some French growers are however, unwilling to see robots prune what has historically been a craft-based procedure. ’Technically it's interesting, but intellectually, it's inconceivable. It doesn't fit with my philosophy of making a Saint Emilion grand cru,’ says a producer. Pruning is a particularly sensitive task because it tells the vine how many bunches of grapes to produce and affects its ability to ripen the fruit to perfection. "Each plant is unique in terms of things like vigour, so it must be treated uniquely during pruning," reportedly says Fetzmann of Domaine Louis Latour. "But I can see a robot doing the pre-pruning in November, and humans finishing in March. A machine like this could be really useful stocking data about each individual vine stock, adapting treatments to the diversity in vegetation and soil even within a plot, " he adds.